The New York Times reported on January 30 that the U.S. was expediting the deployment of Patriot Advanced Capability-3 (PAC-3) interceptor missiles to four Persian Gulf nations – Bahrain, Kuwait, Qatar and the United Arab Emirates – thereby paralleling the combination of sea-based Aegis and land-based Patriot missiles intended for the Taiwan Strait aimed at China and in the Baltic Sea targeting Russia. The Gulf deployments are intended for use against Iran. On February 1 The Times of London commented on the coordinated interceptor missile plans: “Tensions in the Gulf between the US and Iran are set to rise further after it emerged that American-made anti-missile systems are to be deployed to Washington’s Arab allies in the region. As in the Baltic Sea and Taiwan, PAC-3 missiles – “dedicated almost entirely to the anti-ballistic missile mission”  and which soon will have their capability increased by 50% with an upgrade called Missile Segment Enhancement – will be used for short- to medium-range and Aegis class warships for medium to long-range missile interceptions. The basic ingredients of a multilayered theater missile shield. Last May an American news source waxed enthusiastic over Aegis capabilities: “The AEGIS combat system, at its heart, is a computer controlled combat and data system. It can simultaneously launch strikes against missiles or other targets in the air, and on land and sea, either surface or underwater. As to the Patriot missile defense system, it is the only component of the U.S. (and allied) global interceptor project to be used in combat, both times in full-fledged wars. Patriots were employed in Operation Desert Storm in 1991 against Iraqi Scud missiles and were based in Israel, not a formal belligerent in the war, and Saudi Arabia, which was and which served as a base for a large percentage of the 100,000 sorties by the U.S. and its allies in the air war over Kuwait and Iraq. The U.S. stationed and used Patriot missiles in Kuwait 2003 during the invasion of Iraq and the North Atlantic Treaty Organization deployed three Patriot batteries (and AWACS) to Turkey before the attack. Unlike other, longer-range, elements of the layered missile shield system, the Patriot has been proven an effective battlefield weapon. It is only defensive in the sense that a shield was a means of defense for a sword-wielding warrior or armor is for a battle tank. It is designed to protect an aggressor from counterattack. 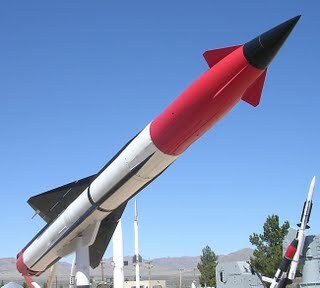 In commenting on the Pentagon’s plans to move Patriot and SM-3 – and even longer-range – missiles into the Persian Gulf, a newspaper in the region wrote that “US anti-missile systems may be installed in Bahrain to protect the country against possible retaliatory attacks from Iran….”  A degree of candor absent in the American press. One which reveals that the U.S. is installing interceptor missiles in the Gulf as it did earlier in 1991 and 2003 to neutralize short- and medium-range missiles fired in response to acts or threats of aggression. One of the false rationales for the expanded missile deployments dutifully retailed by major American and British newspapers of late is that they are intended in part to prevent rather than encourage attacks on Iran by Israel. That argument is contrary to logic and fact alike. By assuring the second nation and Gulf states Bahrain, Kuwait, Qatar and Saudi Arabia which host U.S. infantry, air and naval forces that they are invulnerable to retaliation after attacks on Iran is to increase the risk of unprovoked Israeli and U.S. assaults. Compared to 1991 and 2003, though, the groundwork for a much broader conflict is being laid, one which will include interceptor missiles several stages more advanced than the Patriot and SM-3. THAAD picks up where the SM-3 (which is being transitioned for ground deployment in Europe and the Middle East as part of new – post-September 17, 2009 – U.S. and NATO interceptor missile plans) leaves off and after THAAD comes the Ground-Based Midcourse Defense system to intercept missiles in space (the exoatmosphere). On January 31 the U.S. Missile Defense Agency launched a ground-based interceptor missile from the Vandenberg Air Force Base in California in what proved to be an unsuccessful test. The last such test occurred in 2008 “when [a] target launched from Kodiak, Alaska, was successfully hit by a Vandenberg interceptor.”  Staging long-range missile interception tests from Alaska, including from the Aleutian Islands near Russia’s eastern coast, are not limited to plans for Iran. In mid-January head of the U.S. Missile Defense Agency Lieutenant General Patrick O’Reilly visited Fort Greely, Alaska, “the first line in America’s missile defense” and home to ground-based midcourse missiles, and his comments included: “In a time of war we would launch.”  Missiles launched from Fort Greely would have to pass over Russia, China or both to reach Iran, incidentally. News that the U.S. is to deploy a Patriot missile battery in Poland close to its border led to Russia’s ambassador to NATO Dmitry Rogozin stating recently: “Do they really think that we will calmly watch the location of a rocket system, at a distance of 60 km from Kaliningrad?”  The deployment of Standard Missile-3s, with several times the reach of the Patriot, on land and sea in the same neighborhood will only makes matters more dangerous. China has suspended military contacts with Washington and threatened sanctions against American arms firms involved in the completion of the $6.5 billion deal with Taiwan. The blatant provocations against Russia and China of late last month are being repeated against Iran. What Gates was describing is a comprehensive missile shield in the region that integrates all six Gulf Cooperation Council (GCC) states into a single interceptor grid linked with facilities and deployments in Israel and Turkey (if the latter nation permits it) and a continent-wide NATO system in Europe. Were a leading defense official of any other nation to publicly promote that agenda the newspapers of the world would report it and the Pentagon, State Department and White House would not be silent on the matter. The American media and the government alike would condemn it for what it is: A threat to world peace and to the world itself.